For the last few months, Turkish cinema buffs have anxiously been awaiting the opening of a home-produced World War II spy thriller. The movie, entitled "Cicero," focuses on the life of the infamous Nazi spy Elyesa Bazna, who - in his capacity as valet to the British Ambassador to Turkey in Ankara, Sir Hugh Knatchbull-Hugessen - passed on top secret information to Hitler’s forces during 1943-1944. The spy who photographed a trove of top-secret documents was already the subject of a 1952 Hollywood movie, Five Fingers, starring James Mason. The Turkish film enjoyed great initial success at the box office - until photos of its opening gala event in Istanbul began to spread over Twitter. Indeed, this was not your usual premiere screening. The production team wanted their upscale opening night crowd to actually sense the atmosphere of the World War II era in which the movie was set – so they went, unwisely, for full immersion. So the red carpet led to a makeshift concentration camp, equipped with SS guards and a vicious German shepherd barking in the background, with tattered remnants of inmates’ clothes strewn across a barbed wire fence on which was hung a sign: Achtung! What made this faux-Auschwitz all the more strange, gratuitous and incongruous was that the movie itself is not at all focused on the Holocaust or on death camps, even if it does bring in the tragedy of German children who were victims of the T-4 Nazi euthanasia project. That at least would explain the toys and small shoes piled on top of the red carpet – but not the death camps, to which they were not sent. Indeed, in an interview that took place following the screening, the producer, Mustafa Uslu, explained that the genocide of the Jews had already been presented on film so many times he decided to focus on a different aspect of the Nazis’ murderous policies. This of course begs the question why he opted for the sensationalized Holocaust setting for his gala, if he originally did not think it was "new" enough ground to be a central part of his film. 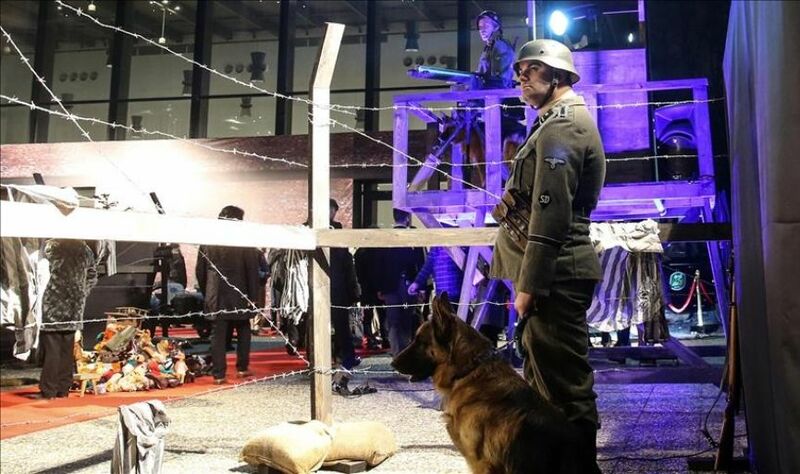 The gala evening’s strange WWII recreation was only briefly covered by the giant media outlet Haber Turk, which ran the story under the headline, "The Nazi Concentration Camp Gala." The bare "which-celebrities-were-spotted" report used a normal tone, and didn’t question the visuals or propriety of partying alongside the props of genocide. With most Turkish media outlets subject to government pressures not to stir controversy, it is no wonder that no other major outlet tackled the topic head on. Indeed, had it not been for a Turkish tweet last week, that strange and distasteful evening would have gone mostly unnoticed. In his tweet, film critic Firat Yucel commented cynically that today’s Turkey would have forced Hannah Arendt to "[re]write the Banality of Evil," in addition to poking fun at the fact that it was reported many onlookers were "moved" by the theatrics. Shortly after that, the story was shared by Ivo Molinas, the editor of Turkey’s Jewish newspaper, Salom. In his tweet, Molinas angrily asked: "How can we explain this [event’s] inexplicable ignorance and insensitivity?" 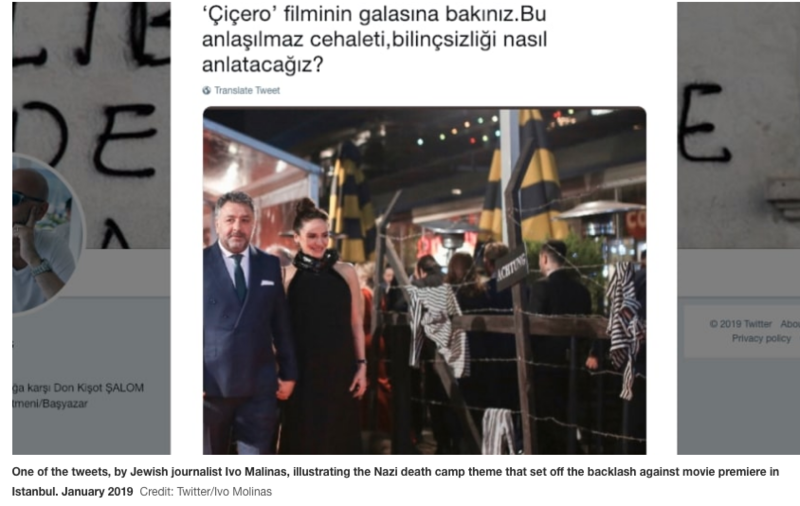 Within no time, a Twitter storm was ignited, and in less than 24 hours the movie’s producer, who was ironically in Germany at the time, officially apologized to the Turkish Jewish community for the gala’s grotesque Holocaust theme and Nazi decor. What’s striking about the outrage the incident caused was the large impromptu coalition that formed to protest it. It was not left to the tiny Jewish community of about 15,000 people to express disgust at the demeaning use of the Holocaust for commercial purposes, but thousands of other voices of protest converged from multiple sectors of Turkish society, both secular and religious, and pro and anti-government. In fact, it was this point that was missed by the producer’s apology, which should not have only been directed at the Jewish community but also to all those Turkish citizens who were legitimately offended. That solidarity also provides us with an interesting window into today’s deeply divided Turkey. It’s more likely than not that this incident was triggered by inexplicable ignorance, rather than explicit anti-Semitism. But the support the Jewish community received in protesting the event serves as yet another example where Turkish Jews have enjoyed growing solidarity in response to cases of anti-Semitism on social media and within the public sphere. It is this part of the story that often goes missing in the numerous news reports that paint the Turkish Jewish community as suffering daily persecution, but misses out on the dynamism and agency of the community itself. It would be foolish not to recognize that the Turkish Jewish community is indeed facing difficult days. It is an aging community beset by the emigration to friendlier shores, both religiously and economically, of its younger generations, and Jewish communal life operates under extreme security measures, in the wake of past attacks on its organizations and synagogues. Then there are the moments when the community is subjected to verbal attacks and threats when Turkey and Israel get into one of their many spats; not to mention the conspiracy theories regularly splashed across the pages of the pro-government press, and anti-Semitic statements that reach all the way up to Erdogan and his inner circle. Even when those accusations are not specifically targeted at Turkish Jews, that hardly makes them any less anti-Semitic, hurtful, or offensive towards members of the community. And, for those sensational headlines that Jews are fleeing from Turkey, one too need to remember that their emigration needs to be placed within the context of the general rise of secular Turks leaving the country due to the failing economy and rise in authoritarian laws. And, like this group of new expats, many of the Jewish emigrees often keep one foot in Turkey, for family and cultural reasons – just in case their new lives abroad do not materialize as they had hoped. One of the greatest developments that goes unnoticed about the Turkish Jewish community is how it is strengthened from within by its outreach towards Turkish society at large. That can be argued is the core reason we are witnessing the very vocal support against anti-Semitism, or, in this case, the outrage over the film gala. That outreach includes lighting Hanukkah candles in public forums, and opening synagogues for concerts and educational events. Then there is the community’s promotion of the International Remembrance of the Holocaust Day and the memorials held for the victims of the 1942 Struma boat sinking, when hundreds of desperate Jewish refugees died just miles away from the Istanbul during World War II. For these events, Turkish government officials are invited to take part, giving them official status. No less important is the presence of community members on social media regularly tweeting Jewish-related news in Turkish on numerous topics of interests. In addition to the communal newspaper whose readership goes beyond the Jewish community itself, there is the online site Avlaremoz (Ladino for "Let's Speak"), where young voices from the Jewish community, together with allies, provide critical analysis of news events related to the Jewish community and monitor closely anti-Semitic acts. The platform also highlights historical events and is far more courageous in engaging in once taboo topics within their own community, such as LGBT issues, and Jewish relations with other communities: not only Turkish Muslims, but also to other non-Muslims, such as Greeks and Armenians. Certainly, the gala incident highlights the complex relationship between today's Turkey and its Jewish community: prevalent anti-Semitism, but also strong voices raised in defense of Jews and against other forms of hate speech. Those voices are also synecdoches for a different Turkish future than the constrained and narrowing present. Just as the Jewish community transformed along with Turkey during the first part of the 2000s, questioning their history and rethinking their place in society, there is still significant parts of Turkish society, which - even if you don't see them protesting on the streets - are still there, and are committed to a more open, pluralistic Turkey.